Published By Leesfield Scolaro, P.A. Has your cruise become an amusement park to the detriment of safety? In the last decade, the cruise experience alone does not work in the economically fierce competition for cruise passengers which has forced all the major cruise lines to turn the travel cruise experience into an “amusement park”. Clear examples of various injuries and death resulting from on-board activities and excursions have risen dramatically, as the cruise ship industry fails to provide true safety. For instance, the industry has refused to provide lifeguards even though there have been numerous drownings in the cruise ship pools. The industry has added a number of excursions even though many are not supervised and present a real danger and jeopardy to the cruise passengers and families. Excursions include private trips to islands owned by cruise lines as well as utilizing off shore activities such as parasailing, jet skiing, boating, scuba diving, snorkeling, kayaking, jeep and bus tours, zip-lining, etc. Over the years, excursions have resulted in countless passengers becoming injured or losing a loved one because the safety of these excursions fall way short of what passengers expect in the United States. The issue for Cruise Lines is that passengers believe these excursions are operated by cruise lines themselves and they rely on such belief to expect a well-oiled and safe operation. 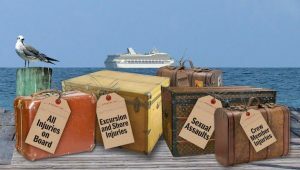 Years of litigation have shown that not only are these off-shore operations not safe, they are utterly inadequately vetted by cruises lines – if vetted at all – which increase risks of injury to unsuspecting passengers. Things are no better on board cruise ships where we are seeing thousands of annual serious injuries to passengers, their family and children from activities never intended to be part of a cruise package. Among the many current cruise claims, Leesfield Scolaro is litigating multiple cases stemming from cruise lines’ inadequate supervision of aquatic rides aboard the ship. More and more, cruise ships are equipped with aquatic roller coasters. These activities are extremely attractive to both parents, and children. Unfortunately that is exactly when people drop their guard and incidents occur. That is how children’s teeth become injured to the point of disfigurement, or how children sustain fractures due to improper supervision by crew-members. In the last few years, litigation against cruise lines has been mounting for the medical malpractice of cruise doctors. Ever since an Eleventh Circuit Court of Appeal’s opinion in Franza v. Royal Caribbean, cruise lines have seen more and more lawsuits files against them for their, often foreigners, medical doctors. This past year, Leesfield Scolaro filed a lawsuit against Carnival Cruise Lines for the inexplicable negligence of their on-board physician whose misdiagnosis and refusal to evacuate a patient resulted in irreversible brain damage to a minor child. Before the Franza decision, Cruise Lines felt they could escape any and all liability for their doctor’s malpractice. They made the business decision to hire foreign doctors, who often do not have the level of education and training sanctioned at American schools of medicine. As an added bonus, foreign doctors are also cheaper than American doctors and that equation allowed cruise lines to save money, while advertising on their websites and brochures that they have high skilled medical professional on board trained to handle all passengers’ medical needs. Following the Franza decision, cruise lines changed … nothing, so much so that foreign doctors are still the norm aboard cruise lines. That is why more and more lawsuits will continue to be filed, and most importantly, more and more cruise passengers in need of professional attention will receive inadequate, and often times dangerously incompetent medical care. In the early days of “cruising” around the world, passengers saw cruises as a mean to discover other regions of the world. Today cruising is not a mean to anywhere, it is an end to non-stop entertainment aboard floating cities, with clubs, casinos, pools, theaters, unlimited alcohol, basketball courts, mini-golf, children centers, water slides, etc. On land, each of these activities require specifically trained staff and safety rules and regulations to minimize risks and prevent injuries to guests. A contrario on cruise ships, often times crew-members will lack the proper training and passenger safety is an afterthought. Cruise passengers must remain mindful of the fact that safety on cruise ships is not at the top of the list of cruise lines. 24/7 year-round entertainment comes at a price, and that is a price cruise lines have made a business decision to pay, one verdict at a time. Copyright © 2016 – 2019, Leesfield Scolaro, P.A.